For this years Cinco de Mayo celebration, try taking a traditional dish a little further south of the border. 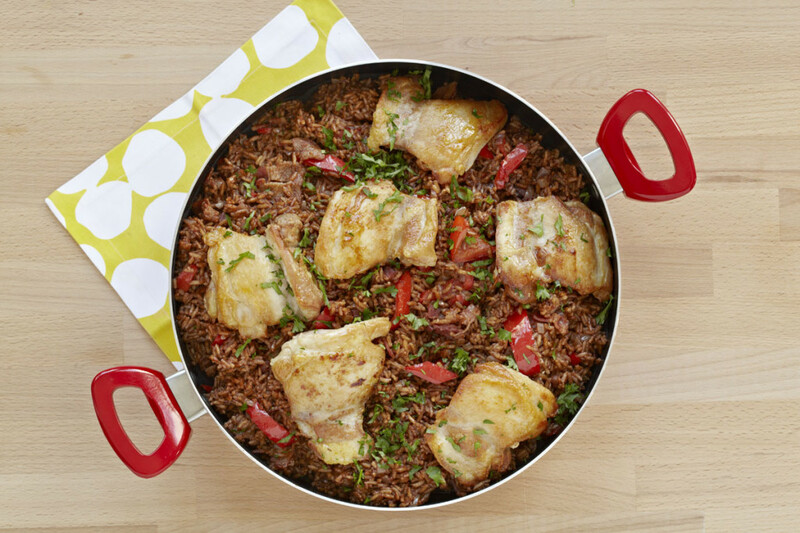 George Duran’s recipe for Arroz con Pollo Mole (Rice and Chicken) is packed with unexpected ingredients and a combination of sweet and salty flavors. This Mexican dish smells as delicious as it tastes. • Mix first 6 ingredients in a small bowl and set aside. • Dust chicken thighs with flour and season with salt and pepper. Heat vegetable oil in your IMUSA Non-Stick Caldero on medium-high heat and cook chicken until browned, about 3-5 minutes on each side. Set aside. • Lower heat to medium and cook bacon until slightly browned. Add onions, red peppers and garlic and sauté until softened, about 3 minutes. Add rice, tomato paste, chocolate and dry spices and mix. Add chicken stock and mix again. Allow to come to a simmer, cover and turn heat to low. Simmer for 25 minutes. • Uncover, and gently mix rice and add chicken thighs on top. Cover and continue simmering for 20-25 more minutes until thighs and rice are cooked. If needed, add more stock or water until rice is done. • Allow to rest for 10 minutes before serving with finely chopped parsley. If anyone is wondering what a “IMUSA Non-Stick Caldero” is, it’s just a nice deep pot, often with a glass lid (9″ to 12″ in diameter). If you don’t have a cheapie aluminum one, a dutch oven would also work in this (I’m guessing). For you foodies and foo-foo types, Verna’s in AG sells a really nice Le Crueset Dutch Oven for around $200, and it’s “family heirloom worthy” in my book. Ask for a stainless lid handle, though (she threw mine in for free, as I was making some heavy purchases there… I love her store). Note: I’m not talking about the camping style dutch ovens (with feet), but the actual Dutch/French style that are similar to the afore-mentioned Caldero. If you’re on a budget, a cheap aluminum caldero can be had for under $50 (sometimes under $20, but prob. not on central coast). I would also like to add: I would love to see a recipe-idea section (like the new literary corner). Something that allows locals to share their favorite (and/or family) recipes! Something “non-foodie” (no one likes foodies, really, except other pretentious foodies) for normal, well-adjusted people to just share and talk about their recipe’s history, etc. I would like to make a very angry comment about information contained in the above article, oh wait, um, I don’t. Sorry.